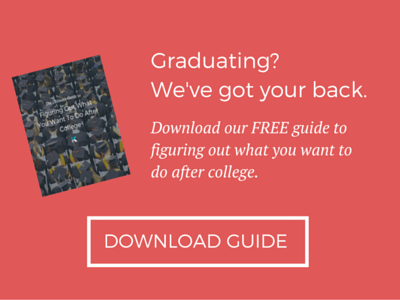 Graduating from college is one of the most exciting times in your life. You get to walk across that stage (ugly hat and all), shake hands with someone important who you’ve never even seen on campus, grab hold of that expensive piece of paper, and finally get started with your “real” life. Looking forward to your college graduation is inevitable. But, that enthusiasm is also balanced with a hefty dose of terror. You can’t wait to get out, yet you’re not sure you want to leave. You’re excited for the next chapter, yet you’re not entirely convinced you know what you’re doing. Have no fear! There are plenty of productive things you can do before graduating that are sure to have you prepped, primed, and ready to take on that thrilling and simultaneously daunting “real world.” Take the time to cross these things off your to-do list, and you can walk off that graduation stage feeling confident, polished, and ready to go! When you apply for a job, what do you think the hiring manager is going to do immediately after reviewing your resume? Yep, you guessed it — they’ll look you up online. In fact, 93% of hiring managers will review a candidate’s social media presence before making a hiring decision. So, you don’t need me to tell you that your online reputation should be in tip-top shape. Take a few hours to clean through your social accounts and remove any content that might make a recruiter hesitate. That means pressing “delete” on any posts with cursing, trash talk about a former employer, and — yes — that photo of you riding a mechanical bull on your 21st birthday. Subscribe to the golden rule of social media: if you wouldn’t want your grandma to see it, you’re better off taking it down. Aside from social media, it’s also a good idea to create (and start using) a professional email address. Many schools will actually deactivate your “.edu” email address a few months after graduation. Even if they don’t, your college address essentially broadcasts that you’re a recent graduate with little to no experience. So, it’s a smart idea to set up a professional address that you can use to apply for jobs. And, spoiler alert, that “partygurl496@hotmail.com” address you created your freshman year in high school probably isn’t going to cut it. Once you’ve completed your online housekeeping, it’s time to start making some positive additions to your online representation. First, create or update your LinkedIn profile to make sure it appropriately illustrates what an accomplished and qualified candidate you are. Switch out your profile photo, write a powerful summary, craft an attention-grabbing headline, and update any old information. Also, if you’re in an industry that lends itself to an online portfolio, you’ll want to set one up or polish up your existing one. My portfolio was actually created as a project for a college course, and I can hardly explain how helpful it was when I began applying for jobs. Without any real work experience, having actual projects and samples that I could show potential employers was a huge asset. Obviously, you need to represent yourself as a professional both online and off. So, if your voicemail greeting currently features your best karaoke rendition of “Shake It Off,” it’s probably time to swap that out for something a little more polished. Although, I’m sure you did Taylor Swift proud. Finally, it’s also time to start thinking about what you’ll wear to various job interviews. It seems like a minor detail. But, the earlier you figure it out, the better. It’ll save you from attending your first interview in your mom’s 80’s blazer — complete with shoulder pads. Here it is — the part you’ve been dreading. Before you graduate, knock off the cobwebs and update your resume. Applying for jobs is stressful enough without having to whip together a resume in the heat of the moment. Whether you want to start from scratch or update your old resume is up to you. Just remember to proofreadvery carefully before submitting it anywhere — you can even have a friend look over it for you for extra peace of mind. What’s one of the biggest mistakes I’ve seen on resumes? Changing the end dates on past positions or commitments, but leaving the entire description in present tense. It’s an immediate red flag that you updated your document in haste, so ensure that you read through it with a fine-tooth comb before blanketing the world in your resume! As you already know, if you’re being seriously considered for a job, the employer will likely want to talk to a few references who can speak about your character and work ethic. So, you not only want your references to be people who think highly of you, but also people who know about your recent accomplishments. A prospective employer doesn’t need to hear about your game-winning goal from your high school soccer coach. Sit down and make a list of the people you’ve connected with throughout your college career — professors, academic advisors, extracurricular directors, and your boss at your campus job. Then, go through your list and pick three to five of those people that you think would be your best references. Approach them personally or send them an email to ask if they’re willing to be listed and boom! You have that pesky step accomplished before you even get your diploma. College campuses are pretty tight-knit communities. And, as much as you might look at this as an inconvenience, it actually means they’re a total hotbed for effective networking. So, take advantage and make an effort to meet as many new people as you can! Attend your college’s career fair. Get involved in different groups on campus. Head out to a campus event. Stop into the career center to find out how you can get connected with alumni in your desired career field. Not only will you make a few new friends, you’ll also meet peers and professionals that could potentially benefit your impending job search! Before graduating, you should also set up informational interviews with a few companies that peak your interest. This is your chance to sit down, learn more about a particular job, company, or industry, and decide where you really want to focus your job application efforts. If nothing else — they’re a great way to hone and improve your interview skills! Alright, so maybe this isn’t a “career booster.” But, I still thought it was an important thing to mention — even if it’s not traditional career advice. Try to save as much money as you can while you’re at the end of your college career. Yes, you’re still allowed to go out with your friends and enjoy your last few months in school. However, you should make an effort to squirrel away your pennies here and there. Even if you’re lucky enough to have parents who are willing to let you crash in your childhood bedroom for a while (thanks, mom and dad! ), it won’t be long before those pesky student loans kick in. So, you’ll want to have as much cash stashed away as you possibly can. Because, real talk, life is expensive.